Have I mentioned how much I love milkshakes? Now let's talk about this shake. You know I love S'mores based on all my previous posts, so obviously I am going to love a toasted marshmallow shake. 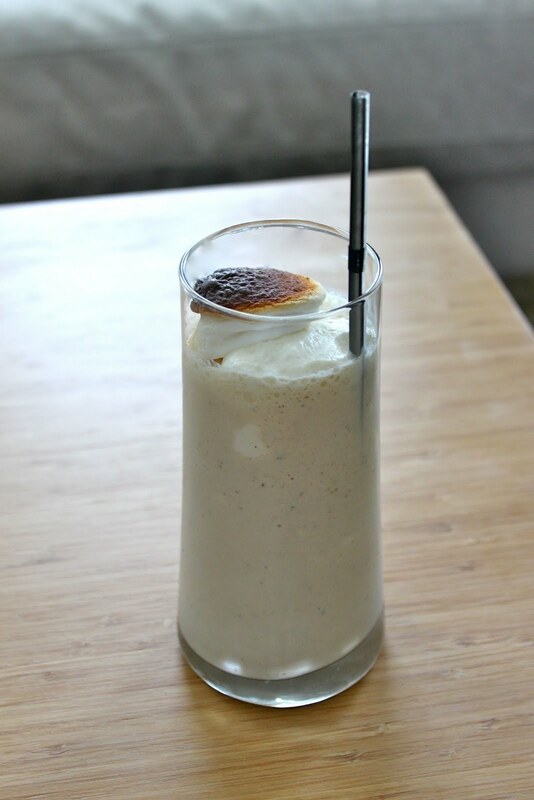 I once attempted to add some chopped milk chocolate this shake to make it more s'mores like and it was a nice addition, but I think I preferred it without. I may try to mic in some graham cracker crumbs next time, but really it is perfect as is and needs nothing. Preheat broiler. Line a baking sheet with aluminum foil and spray with cooking spray. Spread the marshmallows on the baking sheet and place in the oven until nice and brown. Let cool. In a blender, mix the milk, ice cream, and all but two marshmallows. Blend until smooth. Pour into two glasses and top with whipped cream and reserved marshmallows. Serve immediately. I am in a caramel phase. Ever since I found out I could make homemade caramel, I have been craving it and wanting to make it at every occasion. These bars were featured a couple weeks ago on Tracy's Culinary Adventures. I wanted to make them right away, but I managed to hold out a couple weeks. These bars were truly delightful. 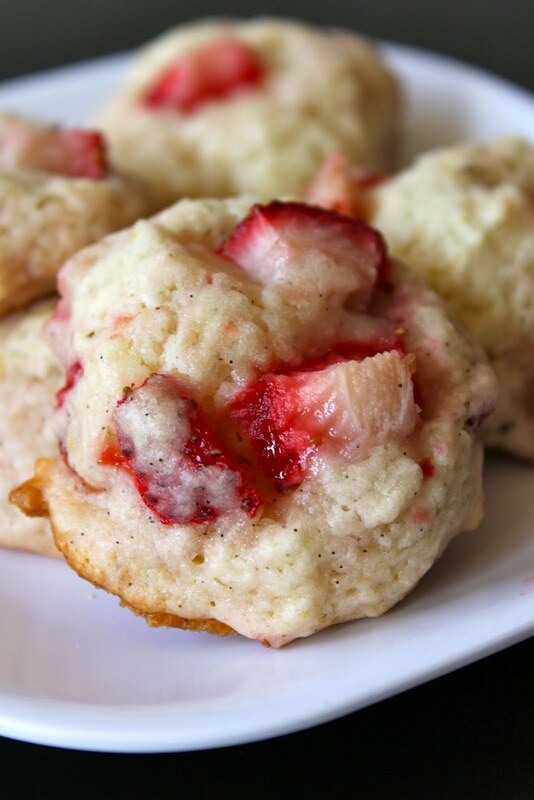 They are sweet, rich, gooey and surprisingly easy to make. Preheat oven to 350 Fahrenheit with a rack in the bottom third of the oven. Spray a 13x9 pan with cooking spray, then line the pan with aluminum foil or parchment and spray again with cooking spray. To make the dough: In the bowl of a stand mixer fitted with the paddle attachment, beat the butter, sugar and salt on medium speed until soft and light, about 2-3 minutes. Beat in the vanilla. With the mixer on low, add 2 1/4 cups of the flour, beating just until the dough is smooth and the flour has been absorbed, and stopping to scrape the sides of the bowl and the paddle as necessary. Transfer 3/4 of the dough into the prepared baking pan. Press the dough evenly into the pan to form the bottom layer. Transfer the pan to the refrigerator while you make the filling and top layer. Add the remaining 1/4 cup of flour to the remaining dough in the mixer bowl and work it in with your fingertips until 1/8 - 1/4-inch crumbs form. Set aside. To make the filling: In a medium saucepan, combine the butter, corn syrup, brown sugar, condensed milk, vanilla extract, and salt. Bring to a simmer, whisking occasionally. When the mixture begins to boil, whisk frequently until it begins to thicken and darkens in color slightly, about 10 minutes. Remove from the heat and let cool for about 10 minutes. Remove the pan from the refrigerator and pour the filling over the bottom crust. 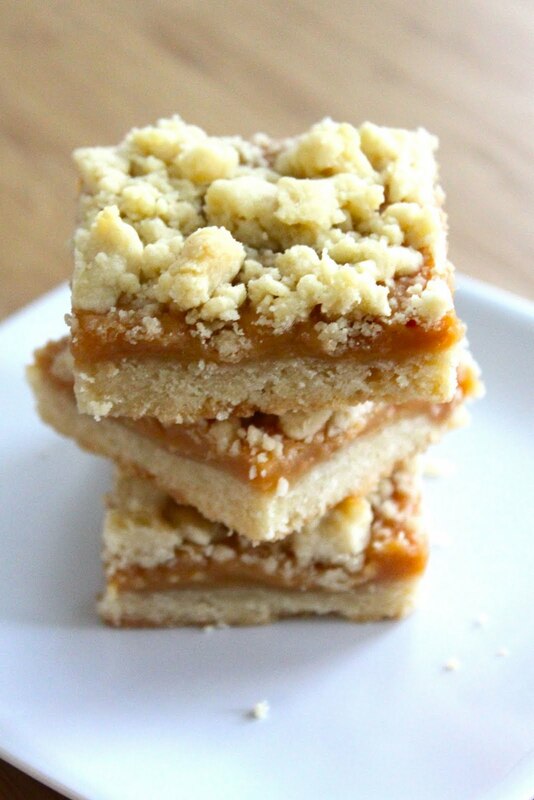 Use an offset spatula to spread it evenly then distribute the crumb topping over the filling. 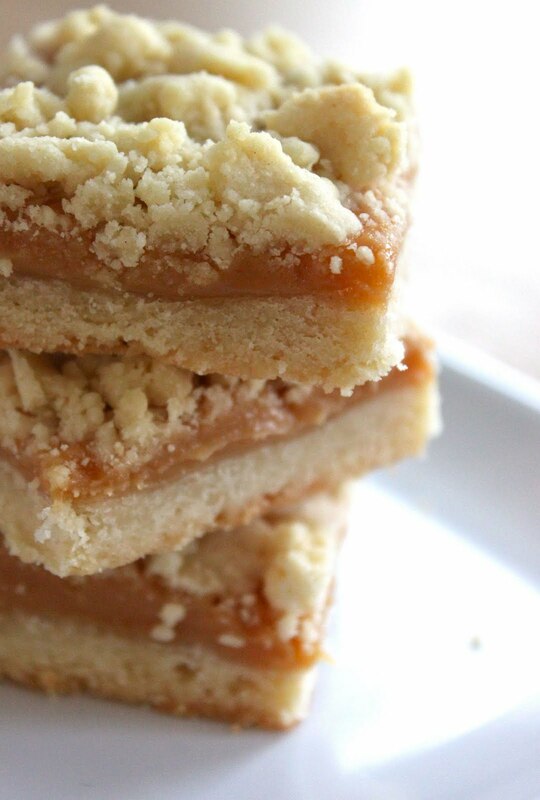 Bake for about 30 minutes, or until the filling is gently bubbling and a dark caramel color. Cool the bars in the pan on a wire rack until lukewarm, about 15-20 minutes. Use the foil (or parchment) to lift the bars out of the pan and onto a cutting board. Once completely cool, cut into 2-inch squares. A couple weeks ago a friend of mine asked me if I could make a German Chocolate cake for her to take into work. 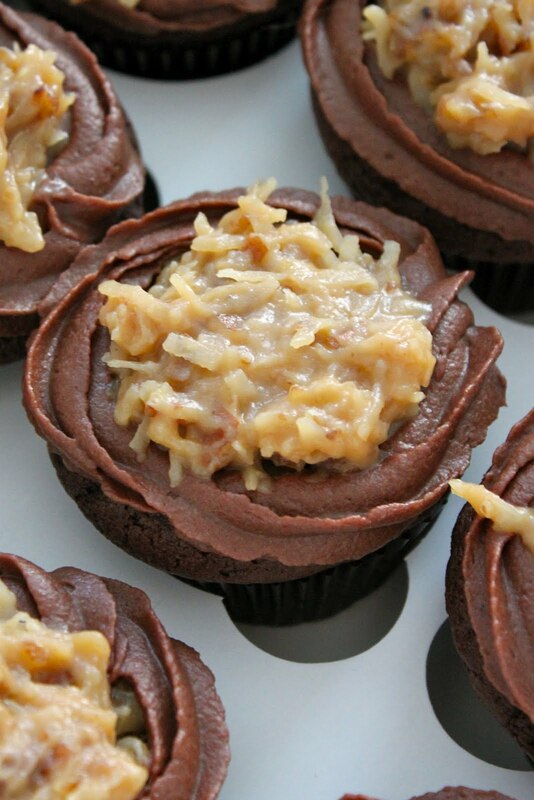 I suggested German Chocolate Cupcakes and we planned a day together to bake these. These cupcakes were rich, gooey, and sinfully delicious! We had a ton of fun making them together and managed to take a break at the pool while the Carmel Coconut Pecan topping cooled. These cupcakes are so much easier than the German Chocolate Cake I made last summer and maybe slightly more delicious. To make these I combined elements of several different recipes and they turned out so well. These will definitely impress! In a large bowl, mix together the cake and pudding mix, sour cream, oil, eggs, vanilla extract, and espresso dissolved in water. Bake for 20 minutes, or until top is springy to the touch and a wooden toothpick inserted comes out clean. Cool completely before topping. Once cool, pipe outline of Chocolate Buttercream. 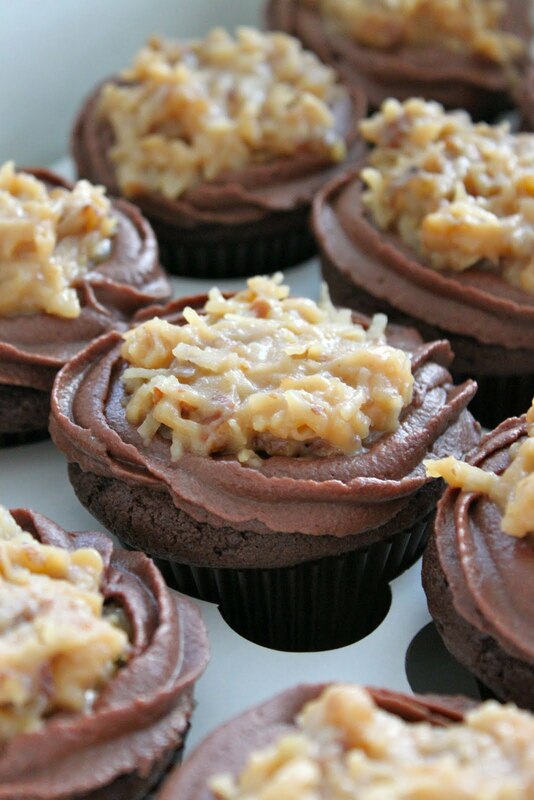 Spoon Coconut Pecan Frosting in the center of each cupcake. Combine egg yolks, evaporated milk, and brown sugar in a saucepan. Add butter, and cook over medium heat, stirring constantly, until thick, about 10 -15 minutes. Pour through a fine sieve into a bowl. Stir in vanilla, salt, coconut, and pecans. Let cool completely. Frosting can be refrigerated in an airtight container for up to 1 day; bring to room temperature before using. Cream the butter on medium speed until it is very light in texture. Add the confectioner's sugar, cocoa powder, melted chocolate, and vanilla extract and mix on a low speed until the sugar and butter are blended, scraping down the bowl with a rubber spatula as needed. Increase the speed to medium, with the mixer running, add the milk one tablespoon at a time until you reach the desired consistency. I recently became obsessed with the blog "Bakergirl, Confessions of a Budding Baketress". If you don't know who I am talking about you may remember her from the AMAZING S'mores Cracker Candy I posted a couple weeks ago. When I found her blog, I went back and read every single post and then proceeded to mark just above every other recipe as a favorite. I was not planning to make these cookies when I did, but it was one of those nights. I was planning on making a strawberry pie to take back to WV for the 4th of July. I have never made a Strawberry Pie and thought it would be a nice accompaniment to the blueberry pie I was planning to bring. To make the strawberry pie I was planning I needed to pre-bake the crust. I did and when it came out I was not satisfied with how it looked. I tried a new crimping technique and it was just not quite what I wanted. I had extra dough in the freezer so I let Zack eat the baked crust. Of course I should have just used the first crust and it was silly of me to be so persnickety. I proceeded to roll out the second crust (after it thawed), noting it had an odd smell. I went ahead and put it in the oven only to see the oddest things happen. Half the crust cooked, a third shrunk, and a third stayed completely raw. Not to mention that the odd smell I noticed when I rolled it out had now amplified and stunk up the entire kitchen. Apparently my pie dough recipe does not last in the freezer six months. Note taken! At that point I knew I needed to make something with my strawberries and in came these cookies. These cookies are quite delicious, but they really MUST be eaten the day they are made. I made too many and ended up tossing most of them because they get soggy on day two. That being said, if you know they will be devoured in one day (and they will because they are delicious) you should definitely make them. Preheat oven to 375 degrees Fahrenheit. Line two baking sheets with parchment paper. 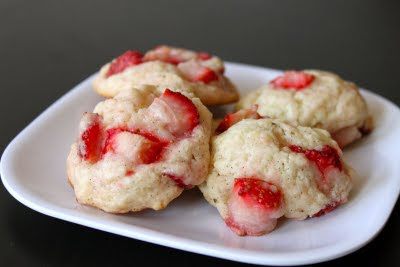 In a small bowl, stir together the strawberries, lemon juice, and 2 tablespoons of the sugar; set aside. In a large bowl, whisk together the lemon zest, vanilla bean scrapings, and remaining sugar. Rub the zest into the sugar with your fingertips until moist and fragrant. Add the flour, baking powder, and salt to the zest/sugar mixture and whisk to combine. Using a pastry cutter to cut the butter into the flour mixture until you have coarse crumbs. Add the cream to the bowl and stir until the dough starts to come together, then very gently fold in the strawberry mixture. Drop rounded tablespoons of dough onto the prepared baking sheet, evenly spaced apart. Sprinkle with coarse sugar. Bake for about 10-15 minutes, or until the cookies are golden brown. Transfer the pans to wire racks and let the cookies cool. Serve the day they are baked.